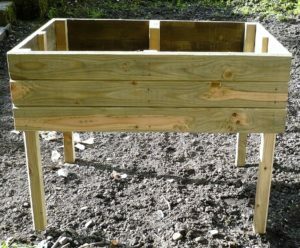 Large vegetable planter. Solid pressure treated timber. 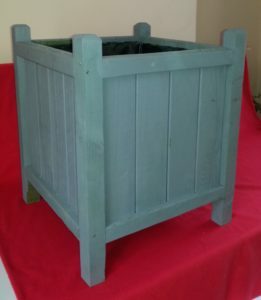 Size approx 100cm L x 70cm W x 100cm H. A raised vegetable planter with a depth of approx 30cm for growing vegetables or plants without the back breaking bending. Comes ready to assemble in 4 panels. Can be supplied in natural wood finish or painted / stained. Available in other sizes. Liner recommended and can be fitted free if local buyer and delivered or collected assembled. Prices from £40 as flat pack. 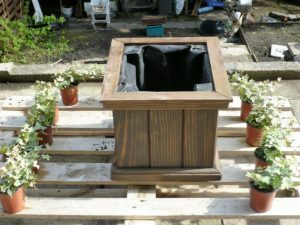 Dark oak effect square planter. Pressure treated softwood for long life. Fully lined. Size : 35cm square and approx 30cm high stained and varnished. Other stains / colours available Price. £30.